This is a pretty set of 10 individual files to use in your classroom and teacher resource files that you sell and distribute. 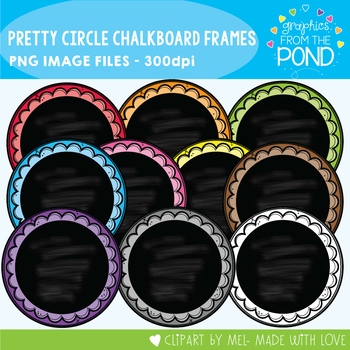 We have included a decorative circle chalkboard frame in each color: white, red, orange, yellow, green, blue, purple, pink, brown and gray. All images are png files - 300 dpi for clear crisp printing! ♥ The image files (clipart) are NOT to be used or redistributed anywhere ‘as is’. You are not able to display, sell, share or give them away as the original image files as I have done. ♥ You cannot use them to make new image files for any reason or clipart to sell or distribute. ♥ They cannot be used online or in digital items - printable projects only (to be used by your user in a secured printable document format). ♥ This license is non-transferable. This means you cannot transfer/ give the license to anyone else, nor can you change the item that it applies to. You cannot give, share, transmit or extend the image files to any other person or company, for any reason. ♥ You cannot use the images in any file where they can be easily removed as the original image file.